Meizu is a brand known among buyers for its affordable yet durable smartphones. As the brand moves towards its 15th year anniversary, it’s getting ready to launch the Meizu 15 Series of phones on April 22. 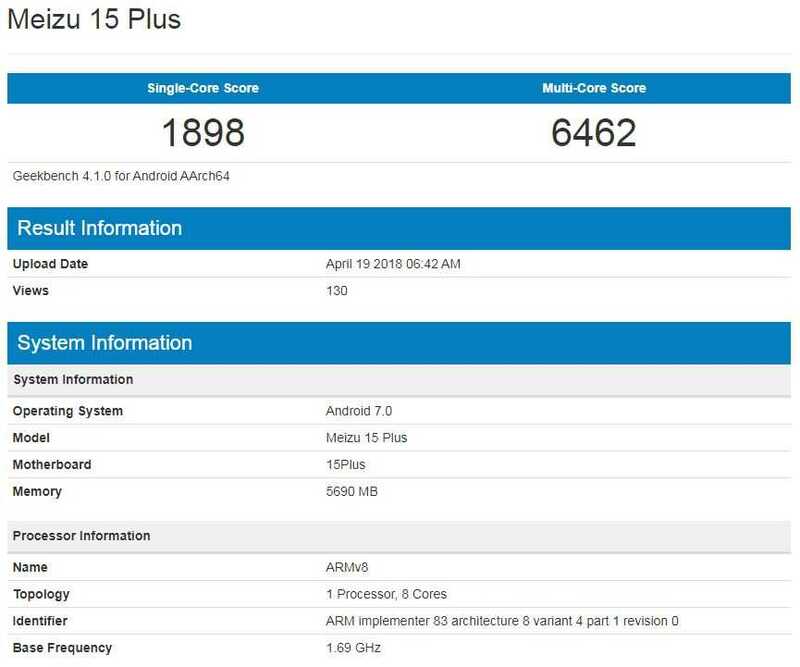 With just days to go before the big launch, the Meizu 15 Plus was spotted first in AnTuTu benchmark just days ago and has now been spotted on GeekBench results. The phone is being benchmarked in multiple websites days ahead of launch and it’s just a confirmation that this phone has some impressive hardware specifications to look forward to. 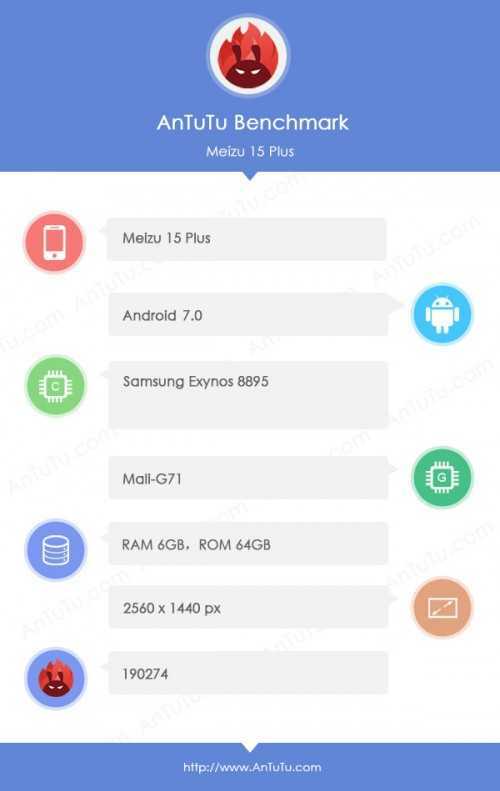 Meizu 15 Series, that includes a couple of other smartphones, is scheduled for the grand event to be held on April 22. The pre-orders for the smartphone models including the Meizu 15, Meizu 15 Plus and Meizu 15 Lite had already commenced on April 18th while shipping will begin from April 29th onwards. The GeekBench scores as confirmed on the official benchmarking website are very impressive. The new Meizu phone which is supposed to be the flagship model of the three confirmed variants has scored 1898 in single-core testing and 6462 in multi-core testing. The device according to reports and AnTuTu is powered by the Samsung Exynos 8895 processor and with such scores, it is sure to perform really good in everyday usage. Samsung’s 2017 flagship, the Galaxy S8, had Geekbench scores almost similar to what Meizu 15 Plus has scored now. Both Galaxy S8 and Meizu 15 Plus have octacore processor clocked at 1.69 GHz however Galaxy S8 had just 4GB RAM whereas Meizu 15 Plus sports 6GB RAM. The phone has generous processing capacity made possible by 6GB of RAM, uses Mali-G71 GPU and has a large 5.95-inch display with a resolution of 2560×1440 pixel. The only drawback spotted in the specifications is that the phone still runs on Android 7.0 Nougat and doesn’t feature 8.0 Oreo. It may or may not get an update which can be confirmed only when the company makes the announcement. On the camera front, the Meizu 15 Plus uses a powerful 20-megapixel rear camera combined with a 12-megapixel camera. The dual camera setup should be capable of capturing amazing photos while there’s an equally powerful 20MP front-facing camera for selfies and video calling. The 15 Plus is speculated to feature a 3,430 mAh battery. The Meizu 15 Plus will be launched along with the Meizu 15 and Meizu 15 Lite on April 22. The hardware specifications, camera and design will be relatively similar between these devices with slight variations based on their pricing. The actual price of the 15 Plus is not known at the moment but it’s just days to go before Meizu makes the official announcement.